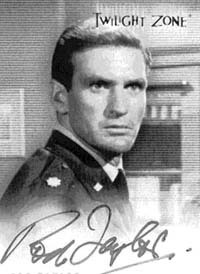 Rod Taylor plays Col. Clegg Forbes, one of three astronauts on man's first space flight. Upon the space travelers' return, however, each of them mysteriously disappears. After the crash landing, Maj. Gart (James Hutton) is hospitalized with a broken leg. But the other two, Col. Forbes (Rod Taylor) and Col. Harrington (Charles Aidman), hit the town. In a bar, Harrington gets a strange feeling, and calls his parents -- but they don't know who he is. Then Harrington disappears, and Forbes seems to be the only one in the bar who remembers Harrington was there. Shaken, Forbes goes to see Gart in the hospital. But Gart doesn't remember Harrington, and neither does their commanding officer. A newspaper shows only two astronauts -- Gart and Forbes -- instead of three. Forbes then gets a strange feeling of euphoria, screams "I don't want this to happen!" and runs from the room. Gart vanishes too, and so does the space ship. 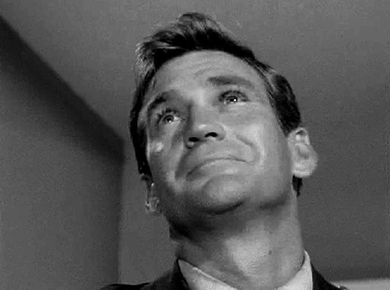 Rod Taylor ... is the focal character of the episode, and his performance is intelligent, appealing and powerful. His is a most difficult task, to make us believe that the impossible is happening -- and he succeeds admirably. Originally, Rod's disappearance -- or the feeling that he was going to disappear -- was written as a very painful experience, but I decided to make it a very euphoric experience. ... Everything had been fear up till then. ... We took an angle on him and we lowered the camera as he was talking, so the effect was that he seemed to be rising while he was talking. 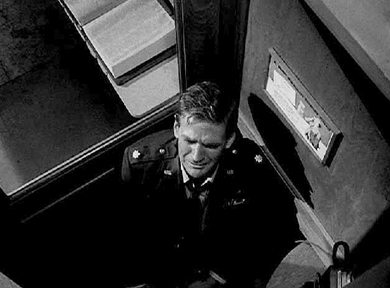 In another scene, Rod Taylor is searching for Charles Aidman, who disappeared in the telephone booth in a bar while they were talking. Taylor gets drunk and he comes to this bar which is now closed and forces his way in. Now, it's not written in the script, but because Rod encouraged me to do things like that, I simply had him walk through the glass door, sort of spin and crash through it into the bar. It was an unexpected entrance and Rod Serling liked it very much. Gloria Pall, the actress who played the girl at the bar who flirts with Rod Taylor, also has mentioned some changes. In a scrapbook she put out about the episode, Pall included the original script for her scene. "The script says I was sitting at a table with another girl [when the two astronauts first enter] and there weren't any lines," she wrote. "I got lucky that day by getting three lines. Hooray!" Rod opens by saying that it's been years since he's seen the episode. "I probably even look young and beautiful," he says. He also remarks on the quality of the production and that it only took four days to shoot. Throughout the episode he praises the production values and how good the script was. "One can channel oneself through the script because it is so good. You can let yourself go. ... You have a feeling when something's going good. The material was so good from Rod Serling. ... It was a joy. ... We didn't do too many takes. ... It's difficult to act [such an emotional scene, but] it's easy to get carried away with the script." There are several times he's silent, and he says, "I'm getting wrapped up in this story myself," because he hadn't seen it so long. He said he probably watched this on TV when it first aired "with my girlfriend of the moment." He mentions that Douglas Heyes is the director of the episode and that Heyes was the one who later had Rod and Dennis Cole make "Powderkeg," the pilot for the "Bearcats!" series. He had much praise for Heyes and his crew -- good directing, lighting, an MGM cameraman. He said he is gratified that so many people remember this episode. He likened it to "The Time Machine," which was a "small movie that became a classic, like these Twilight Zones became classics." Twilight Zone Vortex: Blog entry with synopsis and commentary. Twilight Zone trading cards: Like the ones above. "Definitive Edition" DVD boxed set includes the episode and commentary by Rod and director Douglas Heyes.